Happy Team Stryker day everyone! Today’s page is an idea that I’ve had for a long time and just had to wait until the right issue came along so I could implement it. 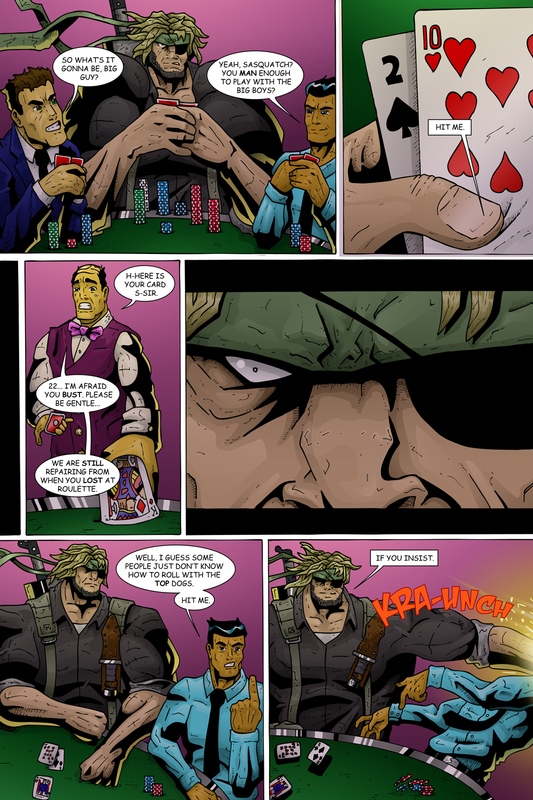 As soon as I decided to do a Las Vegas issue of Team Stryker I knew that I had to have Deadeye at a blackjack table. The idea of having the people he was playing against be really annoying came to me later so Deadeye wouldn’t look like a monster for punching them unprovoked. It was a lot fun coming up with insults for them to call Deadeye since most people are usually too busy running for their lives to mock Deadeye. Over the weekend I was busy working on a Team Stryker theme song with the extremely talented Jeremy Rowan and will hopefully have an announcement about that in the near future. To get a small taste of what Jeremy can do don’t miss next week’s page of Team Stryker as Jeremy guest wrote the page with me!